When you see a huge, dark brown bird with a broad wingspan of up to 7.5 feet and a body length of up to 40 inches and it has a brilliant white head and tail just soaring above you, you know right away that it is a Bald Eagle. What a beautiful site to see too! That plus the fact that the Bald Eagle is the National Bird of the United States is why many people would love to be able to see one. 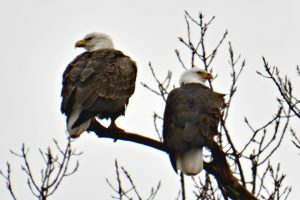 Bald Eagles in winter is the prime time to see them. It is the time of year when the lakes and rivers become frozen up north so thousands of these majestic birds fly south to be able to get to their primary food source which is fish (freshwater and saltwater, dead or alive). They also feed on dead animal carcasses, have been seen eating garbage, and hunt mammals, gulls, and waterfowl. 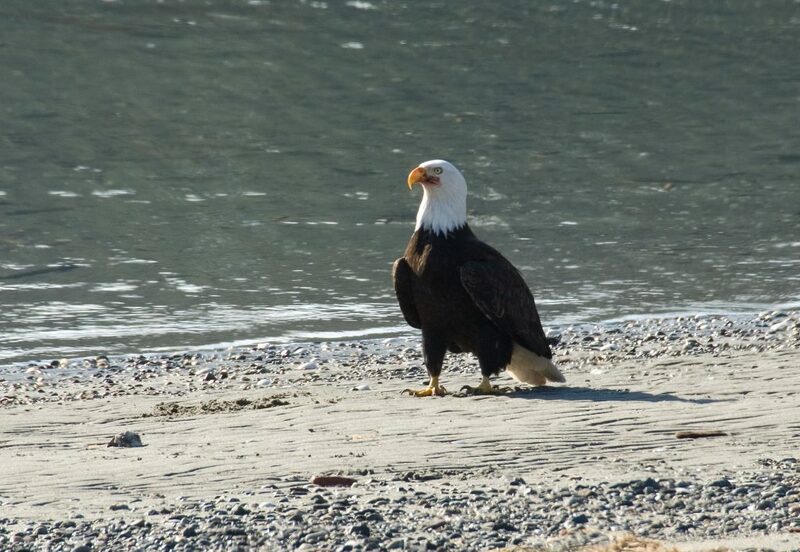 Look for Bald Eagles near rivers, dams, lakes, marshes, along the coast, in wildlife refuges, and even garbage dumps. You may see them soaring over or just sitting on the tops of trees, poles, posts, or any high perch near these locations. They are not too hard to locate with their flashy white heads and their huge dark bodies. I have also spotted eagles near wetlands. They like to feed on the dead fish which are abundant after the waters recede. I have also seen them near farmland feeding on dead animal carcasses. Bald Eagles really aren’t bald. The contrasting white head to their dark body makes them appear bald. Immature Bald Eagles have dark heads and tails. They do not get their adult plumage until they are 5 years old. Female Bald Eagles are larger then the males. Bald Eagles mate for life. 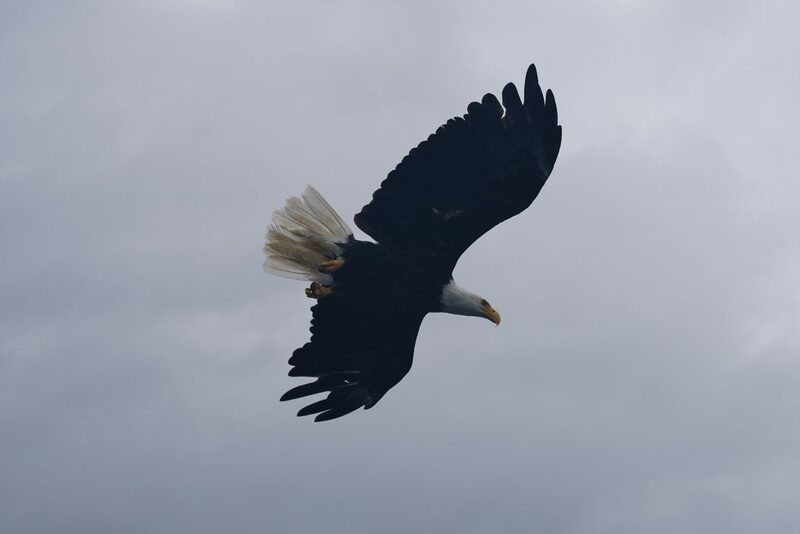 Bald Eagles can fly up to 10,000 feet and soar there for hours. A mating pair will produce up to 3 eggs but may not all survive. Both male and female incubate the eggs. 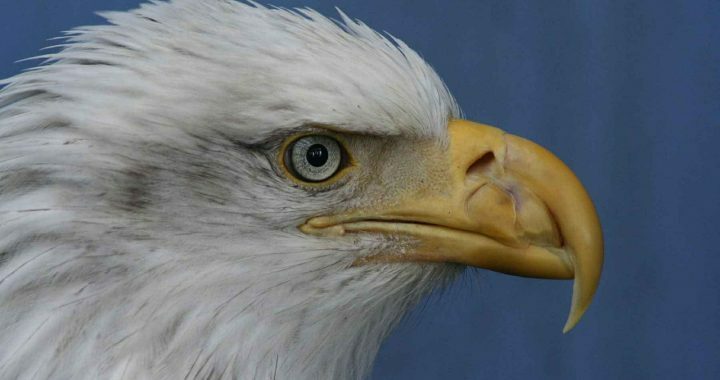 Bald Eagles used to be seriously endangered but made a come back in 2007. While hunting prey a Bald Eagle can dive at about 100 miles per hour. When traveling they fly at around 30 miles per hour. Bald eagle nests are about 5 to 6 feet in diameter and up to 2 to 4 feet tall. If the tree is strong enough, they will use the same nest again and again, adding new materials each year, so some nests can be enormous. They have up to 7000 feathers on their body. A Bald Eagle can live twenty to thirty years in the wild. There are about 70,000 Bald Eagles living in the world today. Where Can You Go To See A Bald Eagle? Bald Eagles can be found in every state except Hawaii. They are more prevalent in Florida, Wisconsin, Washington, Minnesota, Oregon, and Michigan with the the largest concentration in Alaska and British Columbia. A good resource for finding a Bald Eagle is the eBird Range Map. If you go to this site you just enter the bird species (Bald Eagle) and the location where you want to search. It will provide a map of where the HotSpots are (best locations) and it will give you a date when last seen. This site isn’t just for locating Bald Eagles. You can type in any bird species for any state and it will give a range map for that bird and specific locations. It is a great tool for birders. If you haven’t see a Bald Eagle in the wild you should make a point to try to find one. This time of year in winter is the ideal time to spot one too. Since their primary food source is fish they navigate southward where the lakes and rivers aren’t frozen. You may see Bald Eagles around rivers, lakes, dams, along the coast, around wetlands, near farmland, and also garbage dumps. Check along high perches such as trees, telephone poles, and posts, or you may even see them standing along the water’s edge or not far from it. You may even get lucky enough to see more than one at a time as I have, as they are more abundant in winter. If you are searching for specific HotSpots then you can probably find a place close to where you live. Just check out this link… eBird Range Map. 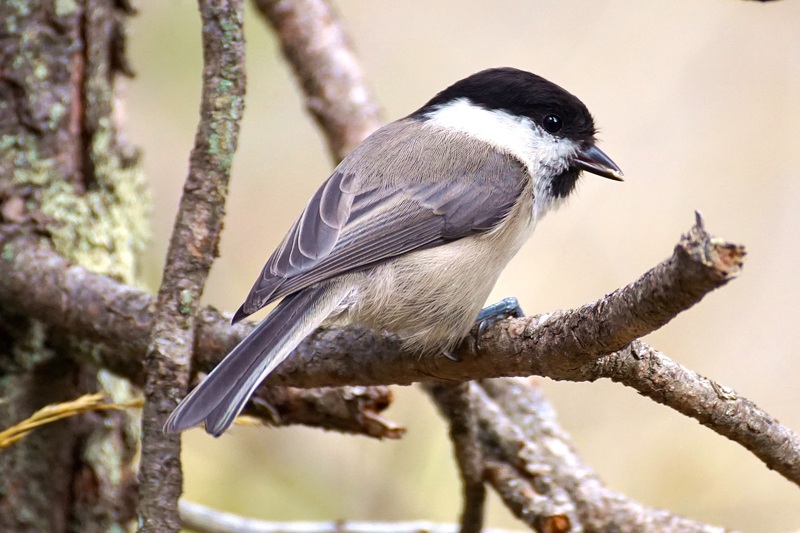 This is a great site for locating any species of bird within a state or city. All you have to do is plug in the information and eBird will give you a map to show you where birds have been spotted and when. My husband uses this frequently to find out where certain birds have been spotted so that he can go look for them himself. It is a great tool. Have you ever seen a Bald Eagle? Where have you seen one and when? I would love to hear from you. Please feel free to comment below. Posted in Birding Hotspots, Raptors Birds of Prey. Bald Eagles are fascinating. I’ve always had a curious eye towards them. Isn’t it amazing that they can fly 10,000 feet high? You see, I’m originally from Brazil and there are no Bald Eagles there. At least, not that I know of. Now that I live in the U.S. I’ll try and find a special spot on eBird Range Map. Eliane, thanks for your comment. Bald Eagles, if seen, are probably rare in Brazil but you do have the Harpy Eagle there and that is pretty awesome too.